In a competitive market, it is imperative for brands who are looking to target youth for the first time, to take the time to truly understand their audience, to ensure their offering is right for the market and to understand their own brand positioning before any planning or promotion takes place. We take a look at PizzaExpress’ maiden voyage into the student market in 2018. Our relationship with PizzaExpress started in early 2018 where we were charged to execute student market research and provide marketing recommendations. Their primary objective was to hit their overriding objective of ‘Driving awareness of PizzaExpress amongst students to increase frequency of visit’’. 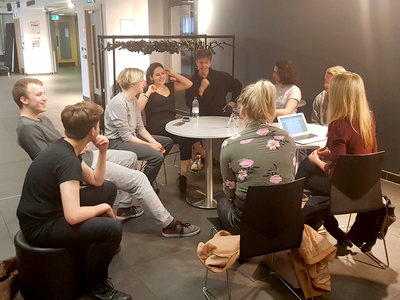 PizzaExpress knew that their student discount offering (40% off Mon-Tues) was strong but they wanted to understand exactly what students want from them as a brand and how to improve their current position in the market. Pizza exclusivities are rife within the student market, PizzaExpress are excluded from promoting through a large proportion of University campuses and Students’ Unions. With the above in mind, we set about conducting quantitive and qualitive research through 10 key locations across the UK, identified by PizzaExpress. The quantitative research would allow us to transform the numerical data into usable statistics to quantify attitudes, opinions, behaviours and other defined variables. The qualitative research would allow us to gain an understanding of underlying reasons, opinions and motivations. By cross analysing the survey results with the focus group feedback we would be able to uncover trends and form a deeper understanding of students. A survey was created for students in order to understand their habits and behaviours in terms of casual dining and to also understand their perception and relationship with PizzaExpress. The survey was sent out to over 230,000 students through protected and certified student only databases across the UK. Our qualitative research took the shape of intimate focus groups on campus at each of the key locations. All creative and advertising must trigger students motivators to buy including hunger/cravings. Self reward and socialising activity. The tone and message must reflect the product or brand being represented, yet be in touch with the student psyche. The colour and imagery should be bold and eye catching. Yellow was suggested to complement the black and white of the PizzaExpress logo which made for a striking combination. 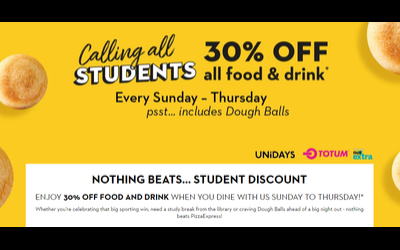 Whilst 40% off food and drink for up to 10 people on Monday’s and Tuesday’s was one of, if not the best student discount in the casual dining sphere, the limitations of the offer made it inaccessible to a high proportion of the student population. The current platform only accessed 20% of the student population resulting in 80% of the student populous unable to claim the discount. Promotion of the offer on the digital platform was also weak yielding minimal results. 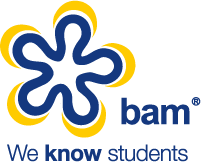 BAM recommended that the student discount needed to be made available to all students to obtain maximum success. In addition the discount duration was too restrictive and unappealing, we recommended the days should be extended to be more attractive and competitive with others in the market. In light of the pizza exclusivities restricting the routes to market for PizzaExpress, we recommended a two pronged attack targeting Freshers Fair and Accommodation Blocks. Freshers Fairs are the pinnacle time of year for any brand with the student market as a key demographic in their marketing strategy. In these first 100 days they are on a journey of new identity and beginnings, which means that Freshers Fairs are the very best place to start a relationship with students. With dough balls recurring throughout our research in popularity, an experiential campaign with the offering of free dough balls was a must! Where PizzaExpress were blocked from attending Freshers Fairs, student accommodation blocks were recommended as an effective alternative. Students are arriving to their new student accommodation to start their new life living away from their parents and guardians for most likely the first time. PizzaExpress would have the unique opportunity to be a part of this key time in a students lives by providing a warm welcome in the form of free pizza. 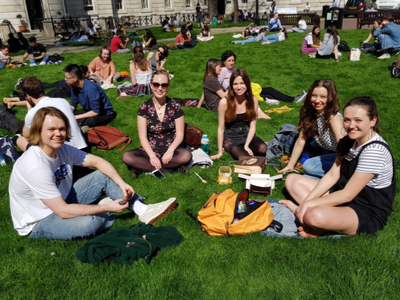 Not only do students love freebies but they will also appreciate this random act of kindness in what may be a scary time, allowing them the opportunity to bond with their new housemates and ultimately form a positive connection to the PizzaExpress brand. 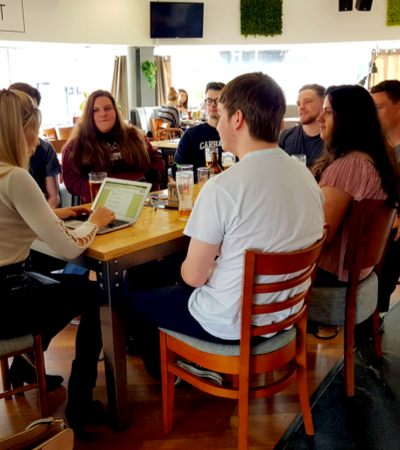 PizzaExpress reviewed our findings and recommendations, using them to help shape their first ever student marketing campaign. The aim of this campaign was to drive awareness of their offering, drive relevance through occasions and grow their reach. PizzaExpress charged BAM with the delivery of their first campaign in the student market. Delighted with the opportunity we got to work organising and planning every aspect of their two pronged attack. We kick started the campaign with the student accommodation block takeovers, targeting 6 accommodation blocks across 3 key cities. BAM organised and delivered every aspect of the campaign from logistics to the hiring of refrigerated vans. Working with the accommodation providers we devised a schedule to ensure we could take over the student rooms just days before the students moved into their new homes. Upon their first entry into the flat they would find striking PizzaExpress branding with directions to the fridge. Inside would be an array of pizzas for the students to enjoy, providing the perfect opportunity for the new roomates to bond and providing the perfect welcome to their new life at University. The vinyl branding provided a perfect way to promote the message of the student offer and encourage students to dine at PizzaExpress. Being their first appearance at a Freshers event, PizzaExpress needed to make a statement. We knew dough ball samples were going to be a big hit with students but we needed a vehicle for distribution. With the desire to be authentic and original we opted for a fully branded trike. The aroma of fresh dough balls would definitely draw the crowd. With so much on offer for students to win and enjoy, along with the bright and attractive creative of the stand PizzaExpress certainly made a statement and stood out from the crowd. Students flocked to the stand for their chance to interact with the brand and get their hands on some amazing freebies. PizzaExpress is a prime example of how important it is to plan an effective approach to the student market. This campaign has shown the potential relationship and positive brand perception you can create with the right message, offering and routes to market. 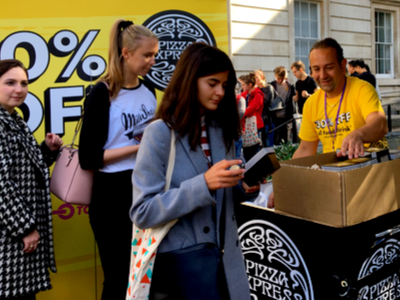 PizzaExpress left a lasting impression on the Freshers of 2018, they dramatically increased their brand awareness and increased the desire for students to dine at their restaurant. With the success of their first student marketing campaign, PizzaExpress are already putting the wheels in motion to go bigger and better for 2019. We look forward to supporting them and seeing their success continue to grow within the student market.